There has been a staggering 2000% increase in unconditional university offers awarded to students in the last five years, between 2013 to 2018. In 2013, a mere 2985 students were awarded unconditional offers, compared to 61, 915 in 2018. To put this in percentage terms: in 2013 0.4 % of offers were unconditional, which rose to 7.1% of offers in 2018. This is all according to UCAS’ latest ‘end of cycle report‘. 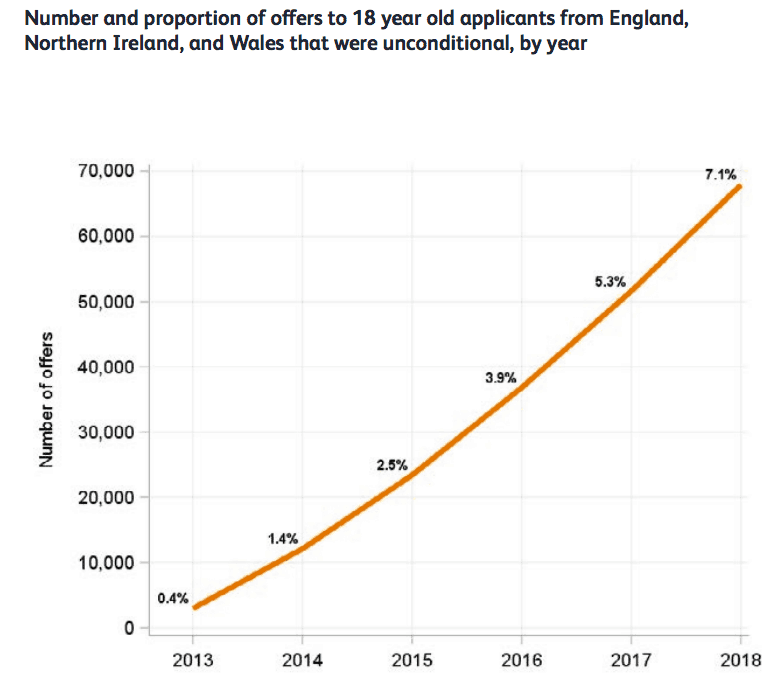 Or to put it in its most ‘dramatic terms’ – that’s a nearly 2000% increase in unconditional offers in 5 years. Why do universities make unconditional offers? The obvious answer from a ‘psychological’ prospective is that an unconditional offer sends out a message to a student that the university ‘wants them’, that it ‘thinks favourably of them’, basically that it ‘likes them’, which makes that university more appealing to the student. My love for you is unconditional, like this university offer…. According to the Vice Chancellor of Sheffield Hallam University, they use unconditional offers to attract high caliber students, which is going to be an advantage in a competitive market place, improving results and the calibre of graduate job the students get, which is all good for surviving in a competitive education market. Universities are also using unconditional offers more crudely, to get ‘bums on seats’ in order to expand. The immediate policy impetus for this was the removal of the cap on the number of students each university could take on. Driving this sort ‘unconditional expansion’ is again the market driven education system – in which you either expand or die. More bums on seats = more profit = more investment to attract more students. It’s just crude survival of the fittest in this crudest of systems. 70% of students support universities giving out unconditional offers, citing the reduction in stress and increase in mental health benefits that this certainty brings. Ironically, this means that while our marketized education system induces more pressure and stress through-out school life generally, ironically it’s created a ‘stress free’ window for those students who get unconditional offers in their final year 13. What are the problems with unconditional offers? There is evidence that receiving an unconditional offer makes students ‘switch off’ – 56% of students missed their targets by two grades or more, compared to 67% of students with regular ‘conditional offers’. Or to put it more bluntly, those students who ‘have to pass their A-levels’ to get into the university of their choice are 10% more likely to do so than those who have just been gifted a place. As an A-level teacher, I can testify that this is more than a bit crap when you are judged on your results… it means 7% of your students more likely to underachieve and there is literally nothing you can do can to motivate some of them. Unconditional offers undermines the ability of 16-19 teachers to meet the targets they are judged by. This is thus dysfunctional. Underachieving at A-level might also come back to disadvantage students when they apply for jobs. Employers do look at A-level grades after all, and CCC is going to look a bit slack compared to a 2.1. It sends out the message that a students switches off when they can, rather than always giving their all. And if there’s more than one candidate or more for a job, the chances are they’ll be someone else in the field with a 2.1 and BBB (or whatever their target grades were at A-level). It’s also extremely unfair… seven percent of students with a stress-free ride, compared to the rest of students having to achieve. It’s just not equitable. The UCAS report does show that higher attaining students are most likely to be required to get their grades, which unconditional offers mainly going to mid-range students, and in terms of subjects, medicine hardly gives out any unconditional offers, whereas it’s the creative arts which give out the most. This does suggest that unconditional offers are being used to widen participation, however, I’d need to see how this relates to retention to make a judgement as to how effective this is. Final thoughts – should we ban unconditional offers? If students are required to get grades at the end of 13, then I say yes, simply on the basis of equity. It’s not fair subjecting most students to the stress of having to achieve and a significant minority to an easier ride. Also, I don’t see how scrapping unconditional offers is going to prevent universities expanding, or from managing their future intake: scrapping unconditional offers would only delay knowing the intake for the next year by 10 months, which is not that long in the grand scheme of things, and there’s plenty of other indicators universities could use in this big data era to forecast realistic numbers with sufficient certainty.